Fragrances are a way of expressing personal style and individuality which makes it a consumer driven industry. The growing trend of wearing perfumes is thus driving the fragrance packaging market. This market is largely governed by fickle and ever-changing trends. Fragrances have become the most important part of personal grooming products, almost making it an extension of one’s nature and personality. Fragrance packaging is a mainstream element of the cosmetic industry and have gained much attention over the last few years. Fragrance packaging manufacturers are on a constant lookout for unique and newer packaging formats to attract different consumer worldwide. Attractive packaging acts as an inspiring feature for fragrance industry. 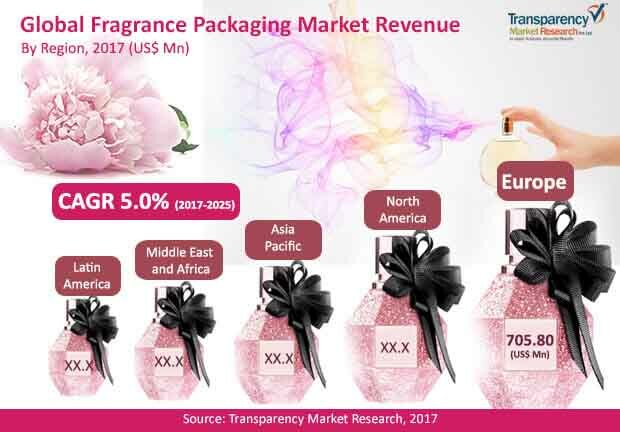 The global fragrance packaging market was valued at US$2,031.9 mn in 2016 and is projected to reach a valuation of US$2,119.9 mn by the end of 2025, registering a CAGR of 5.0% during the forecast period of 2017 and 2025. Fragrance packaging can be done with the help of several materials such as glass bottles, metal cans, plastic roll-ons, and some other products. There is a growing demand for beauty products that the market is flooded with different types of fragrances. The global market is observed to generate revenues primarily driven by premium quality of perfume bottles and high quality designs adopted by packaging companies. On the basis of material type, the global fragrance packaging market is segmented into glass, metal, plastic, and paperboard. The plastic segment is further sub-segmented into polypropylene (PP), polyethylene (PE), polyethylene terephthalate (PET), polyvinyl chloride (PVC), and polystyrene (PS). The global fragrance packaging market is currently dominated by metal material segment. Metal is used in the manufacturing of aerosol cans for deodorant packaging which has high demand among end consumers. However, packaging manufacturers are also supplying plastic based packaging solutions for fragrances. Stick packs and roll-ons are finding new ground among fragrance manufacturers, who are looking for innovative ways to compete on retail shelves. Furthermore, boom in ecommerce is anticipated to witness dynamic shift in strategies adopted by packaging companies operating in the global Fragrance packaging market. On the basis of packaging type, the global fragrance packaging market is segmented into primary packaging and secondary packaging. Primary packaging comprises bottles, cans, roll-ons, stick packs, where secondary packaging consist of folding boxes, hinged boxes, two piece boxes. Among these packaging types, Primary packaging segment is expected to sustain its market preference due to continued preference for fragrances. On the basis of capacity, the global fragrance packaging market is segmented into less than 100 ml, 100 to 250 ml, 250 to 500 ml, and above 500 ml. Among these capacities less than 100 ml and 100 to 250 ml is anticipated to witness high growth during the forecast period. On the basis of end use, the global fragrance packaging market is segmented into perfumes and deodorants. The global Fragrance packaging market is segmented geographically into 5 key regions including North America, Latin America, Europe, the Middle East and Africa, and Asia Pacific. Of these, Europe has dominated the global market due a consistent progress of the market in Germany and France. On the other hand, the growth in North America is estimated to remain slow during the forecast period. Asia Pacific is anticipated to present lucrative opportunities to the overall market as the sales of perfumes gains momentum in developing economies of India and China. Some of the key players operating in the global fragrance packaging market include Gerresheimer AG, Swallowfield Plc, Saverglass sas, Verescence France SASU, Albea S.A., Intrapac International Corporation, Piramal Glass Ltd., Quadpack Ltd, Alcion Plasticos, Coverpla S.A., CCL Container (Hermitage), Inc., EXAL Corporation, General Converting Inc., Glaspray Engineering & Manufacturing Co. Ltd., Premi Spa, Continental Bottle Co. Limited, and Fragrance Manufacturing, Inc.
Transparency Market Research examines the Global Fragrance Packaging market for the forecast period 2017-2025. The primary objective of the report is to identify opportunities in the market and present updates as well as insights pertaining to various segments of the global fragrance packaging market. The report begins with an overview of the global fragrance packaging market, evaluating market witnessed in the global market. Impact analysis of the key growth drivers and restraints based on the weighted average model is also included in the report. To compute the market size, in-depth secondary research is done. Data points such as regional splits and market split by material type, and application has been assimilated to arrive at appropriate market estimates. The report comprises the forecast of the global revenue generated by the sales of fragrance packaging market. TMR triangulates the data via different analysis based on supply side, demand side as well as the dynamics of Fragrance packaging market.TMR not only conducts forecasts in terms of value, but also evaluate the market on the basis of essential parameters, such as Year-on-Year (Y-o-Y) growth. This helps providers to recognize the future opportunities as well predictability of the market. Vital feature of this report is the analysis of the fragrance packaging market by region, material type, packaging type, capacity and end use; and the corresponding revenue forecast in terms of absolute dollar opportunity. This is traditionally overlooked while forecasting the market. However, absolute dollar opportunity is critical in assessing the level of opportunity that a provider can look to achieve as well as to identify potential resources from sales perspective of the global fragrance packaging market. To understand key segments in terms of their growth and performance in the fragrance packaging market, Transparency Market Research has developed a market attractiveness index. The resulting index should help providers identify existing market opportunities in the global fragrance packaging market. In the final section of the report, Fragrance packaging market competitive landscape is included to provide a dashboard view of companies that manufacture and provide packaging solutions for fragrance. The report contains company profiles of some of the players in the global fragrance packaging market. Some of the players operating in the global fragrance packaging market include Gerresheimer AG, Swallowfield Plc, Saverglass sas, Verescence France SASU, Albea S.A., Intrapac International Corporation, Piramal Glass Ltd., Quadpack Ltd, Alcion Plasticos, Coverpla S.A., CCL Container (Hermitage), Inc., EXAL Corporation, General Converting Inc., Glaspray Engineering & Manufacturing Co. Ltd., Premi Spa, Continental Bottle Co. Limited, and Fragrance Manufacturing, Inc.